Cowley College hosted the 11th annual Arts & Humanities Day in Arkansas City on Wednesday, February 17. A total of 178 students, parents and teachers took part in the event. The event was one of the largest in the 11 years it has been conducted. Flickinger also praised the work admissions representative Brandi Gibbs did coordinating the event. Those attending Arts & Humanities Day had the opportunity to compete for scholarships, cash vouchers, and awards. They also got to take in performances by Cowley College’s vocal and instrumental performing arts groups, tour the school’s music, theatre and arts programs, and interact with current students, faculty and staff. Auditions and interviews were held for art and graphic design, creative writing, theatre, studio and musical theatre dance, vocal music, instrumental music, and piano scholarships. Graduating seniors were eligible to audition for theatre, vocal music, instrumental music and piano scholarships. 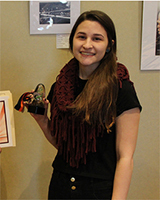 Student artwork was displayed and prizes were given in several different categories. Prizes awarded included scholarships and cash prizes. Graduating seniors were eligible for Art & Design, Mass Media, and Creative Writing Scholarships. Timothy Hardman, who last year won Best of Show in the Senior Division Creative Writing portfolio category and accepted a Creative Writing Scholarship to attend Cowley College, joined Lucia Morales and Nancy Lartey in presenting some of their original works to the students in attendance. 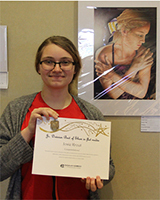 Jocelyn Young of Belle Plaine High School won the Senior Division Creative Writing portfolio, and Quinn Johnson of Arkansas City High School won the Junior Division Creative Writing portfolio. Senior Division, Best of Show in flat media, Crystal Williams, Winfield High School. Senior Division, Best of Show in 3D art, Katee Salas, Arkansas City High School. Junior Division, Best of Show in flat media, Josie Krout, Arkansas City High School. 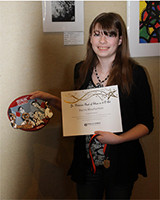 Junior Division, Best of Show in 3-D art, Sierra Weatherman, Winfield High School. Ceramics/Glass, Sierra Weatherman, Winfield High School earned first place; Katee Salas, Arkansas City High School, earned second place; Ashley Evans, Winfield High School, earned third place. Printmaking, Jenny Huertas, Wichita West High School, earned first place; Gabby Leonard, Udall High School, earned second place; Sinem Sahin, Udall High School, earned third place. 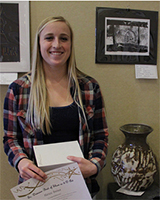 Drawing, Blair Haley, Ark City High School, earned first place; Allison Gladfelter, Oxford High School, earned second place; Savana Hernandez, Ark City High School, third place. Sculpture, Kaushia, Wichita West High School, earned first place; Ashley Dickey, Wichita West High School, earned second place; Tiffany Tatum, Winfield High School, earned third place. Design and Competition, Sara Minton, Winfield High School, earned first place; William Howe, Udall High School, earned second place; Ashley Dickey, Wichita West High School, earned third place. Mixed Media, Sierra Shultz, Winfield High School, earned first place; Allison Willis, Winfield, earned second place; Aclynn Gleeson, Wichita West High School, earned third place. Painting, Ashley Dickey, Wichita West High School, earned first place; Katie Kernell, Winfield High School, earned second place; Sierra Shultz, Winfield High School, earned third place. Photography, Ashley Dickey, Wichita West High School, earned first place; April Aleman, Wichita West High School, earned second place; Ashley Smith, Winfield High School, earned third place. Portfolio, Katie Irvin, Winfield High School, earned first place; Allison Willis, Winfield High School, earned second place; Jasmine Nichols, Winfield High School, earned third place. 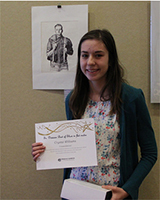 Senior Division, Best of Show in Creative Writing Portfolio, Jocelyn Young of Belle Plaine High School earned first place; Aryana Hess of Derby High School earned second place; Gabe YoNash of Belle Plaine High School earned third place. 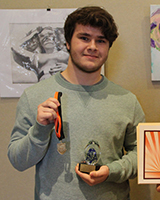 Junior Division, Best of Show in Creative Writing Portfolio, Quinn Johnson of Arkansas City High School earned first place; Royce Hanshaw of Wichita South High School earned second place; Grace Nightingale of Ark City High School earned third place.